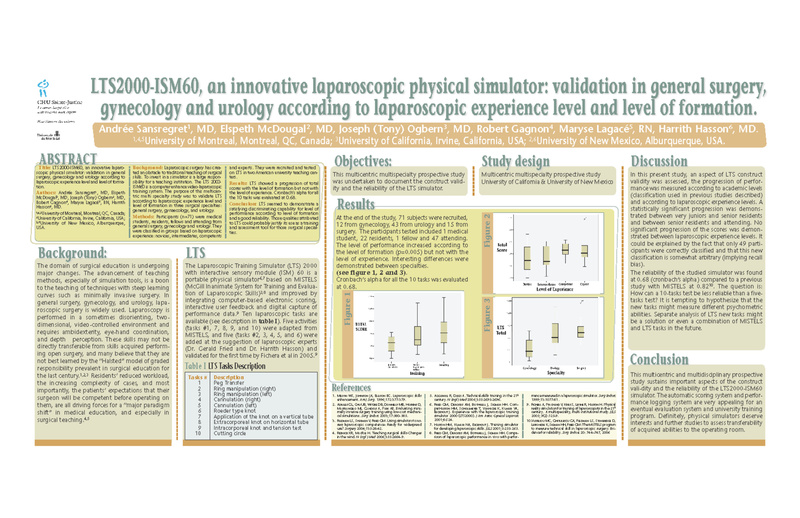 LTS2000-ISM60, an innovating laparoscopic physical simulator: validation in general surgery, and urology according to laparoscopic experience level and level of formation. Background: Laparoscopic surgery has created an obstacle to traditional teaching of surgical skills. To invest in a simulator is a large responsibility for a teaching institution. The LTS 2000-ISM60 is a computer enhanced video-laparoscopic training system. The purpose of this multicentric multi specialty study was to validate LTS according to laparoscopic experience level and level of formation in three surgical specialties: general surgery, gynaecology and urology. Methods: Participants (n=41) were medical students, residents, fellows and attending from general surgery, gynaecology and urology. They were classified in groups based on laparoscopic experience: novices, intermediates, competents and experts. They were recruited and tested on LTS in two American universities teaching centers. Results: LTS showed a progression of total scores with level of formation and with level of experience. Cronbach’s alpha for all the 10 tasks was evaluated at 0.71. Conclusion: LTS seemed to demonstrate a satisfying discriminating capability for level of performance according to level of formation and level of laparoscopic experience. Those qualities attributed to LTS could probably justify its use as a training and assessment tool for those surgical specialties.